Portlandia is a television program based in and around Portland, Oregon (it is also filmed here on location also). The program airs on Independent Film Channel (IFC) and is headlined by former Saturday Night Live cast members Carrie Brownstein and Fred Armisen. The television program has gone onto win numerous awards, including a Peabody. The production initially started as an Internet based sketch comedy show by the two SNL cast members. They just wanted to have a bit of freedom outside of the stricter realms of broadcast television, so they decided to produce an Internet streaming Web series known as Thunderant. They filmed and based the show out of Portland, and as the Internet series continued, the show became more and more Portland based, with many of the sketches appearing throughout the city. Because of this, the two decided to rename the show "Portlandia." As the two saw increased viewership with the Internet crowed they decided to pitch the television program to executives at IFC for a full sketch comedy show, based on the same antics and comedy the two do on the Internet based series. IFC purchased the program and it has since signed up for the third season of the show. There is no real direct storyline with the television show. It, like other sketch comedy shows, such as SNL and MadTV all have different stores and sketches based on events happening in modern pop culture. This is essentially what Portlandia, although most of the sketches occur in different facilities and establishments around Portland. Viewers of SNL are probably familiar with the different filmed segments of the show, not just the live segments. This is basically what Portlandia is. The segments do not go on live but are instead filmed out. Many of the skits have loose dialog, allowing the actors to make most of it up as they go, as long as the reach the necessary tent poles in the story line. With the ability to retake scenes and shots, it gives a bit of a cleaner take on the sketch comedy genre. Portlandia has received a good amount of success, especially for appearing on a television station such as IFC, which does not have a large viewership. However, with the current cast and excellent writers on staff (including the former head writer for The Colbert Report), there are some rather entertaining and professional writers on staff. Peter and Nance interact with celebs on social media; Fred gives Carrie a rock 'n' roll remodel; James rides his bike to work; Gil and George say "Oh, Hello" to Toni and Candace. The mayor sets out to prove Portland's diversity; text-message drama unfolds during a business meeting; activists on a hunger strike take a cheat day; drivers communicate via hand signals. Doug and Claire try an open relationship; Shannon gets help parallel parking; a company uses VR for an important meeting; the Mayor waits for a helicopter; and Fred steps on a snail. Nina and Lance tell the story of how they met; Peter and Nance look forward to breakfast; a couple uses distraction cancelling glasses; and Malcolm and Kris get involved at a community meeting. Fred and Carrie help Rachel navigate the world of dating apps; Kath and Dave take on an escape room; Doug gives his friends benefit fatigue; Andy and Drew swear off women; and Joey tries therapy. Toni and Candace get involved in women's healthcare; Peter and Nance deal with a spicy sushi situation; Kathleen becomes the first female partner at her firm; and a single guy interrupts a couples' dinner. In the Season 8 premiere, Spyke gets his old band back together; podcasters investigate a police station; Candace brings Toni to her childhood summer home; and Brendan and Michelle consider buying a van. Sandra teaches a pit bull self-control. Lisa and Bryce sell instant garbage. A couple explains alcohol to their adult son. Fred discovers models. Nina and Lance deal with an ant infestation. The mayor attempts to break a world record. "Time Tailors" evaluate a man's schedule. The eco-terrorists brainstorm how to make an impressive event entrance. Carrie's in the market for a new friend; Jill tries a radical diet to deal with her office anxieties; Drew and Andy host a movie festival; a scientist comes up with a cure for modern life; Ghavin opens an elaborate box set. Fred gets involved with an arranged marriage; a couple's newly opened movie theater offers an at-home vibe; a school brings in a bully to show students how to toughen up; and a creepy guy leaves a strange reply to social-media posts. Toni and Candace retire but there is still unresolved issues between them. Drew and Andy re-imagine gingerbread cookies. Peter and Nance give a new protein diet a trial run. Fred's new business may have more problematic than successful. Kate and Sam learn the dangers of long distance love. Drew and Andy plan a funeral. Nina gives Lance a massage chair that is a total game changer. Fred and Carrie seek advice from a storytelling expert; a traveler checks into an unconventional hotel; the weirdos discover a store that specializes in bedding and home beauty products. IFC has been airing a delightful comedy show called "Portlandia." SyFy has been airing reruns of a delightful sci-fi show called "Battlestar Galactica." What happens when the two combine? You get an episode of "Portlandia" that features Galactica alumni and Jeff Goldblum. The whole episode is online, and you can watch it right here! Portlandia is currently available to watch and stream on IFC. 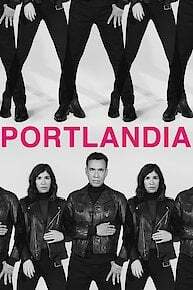 You can also buy, rent Portlandia on demand at Netflix, Amazon, AMC, FuboTV, IFC, Google Play, iTunes online.